AudioBook Ministries formally known as Tape Ministries NW was founded in 1980 at a women’s Bible study at John Knox Presbyterian Church in South Seattle. A woman who was blind mentioned that the local public library had very few faith-based books on tape. In response, several of the women offered to record their favorite Christian book. Crystal Bullis saw the need to expand the service beyond her friend. 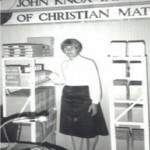 She approached the church leadership with a vision to make wholesome, inspirational material on tape available to the blind and disabled community, and John Knox Presbyterian Church became the sponsor of what was originally called the "JKPC Taped Library." Two employees of another taped library and blind friends provided guidance and suggestions as the library’s first books were recorded by volunteer readers, using newly acquired recorders and microphones. These first taped books were loaned out in February 1981. The library was started and initially run out of the Bullis’ home basement. In the beginning, Crystal directed the library and handled daily operations, including circulation of books. Volunteers recorded the books in their own homes. By 1990, the library was serving more than 300 patrons, the result of referrals and “word-of-mouth”. Its annual operating budget was approximately $1500. Financial support came from the John Knox Church annual budget and small donations from some of the patrons. In 1992, Crystal retired due to ill health, and Bonnie Heutink became the first Executive Director and the ministry’s first paid employee. In August, the library was moved to a new location in the basement of another John Knox parishioner. In 1993, a small article in Guideposts magazine began to attract patrons nationwide. That same year, the ministry incorporated as a 501(c)(3) non-profit corporation, and the name was changed to Tape Ministries Northwest. The library experienced steady growth and, faced an increasing workload, hired a part-time Librarian in 1996. That same year the ministry moved to a small house provided by Highline Christian Church, where they stayed for seven years. The ministry is now housed in a beautiful 2000 sq. ft. parsonage, generously provided by Prince of Peace Lutheran Church. The library has steadily expanded — serving more patrons and increasing the number of book titles and volunteers. In 2016 the organization went through another name change to incorporate many modern technological advances and became AudioBook Ministries. All services continue to be offered free of charge, and though the budget has grown along with the number of people we serve, God has provided, and the ministry has never been in debt. This stable and ongoing growth has been made possible through God’s faithfulness, committed leadership and volunteers, faithful donors, board accountability, wise stewardship and the faithful giving of concerned people.